RG Group are conducting a large regeneration and construction project in Redhill. Over the 75 week duration of the project we have been working with local schools, colleges and the JobCentre Plus to encourage new recruits to the Construction Industry. 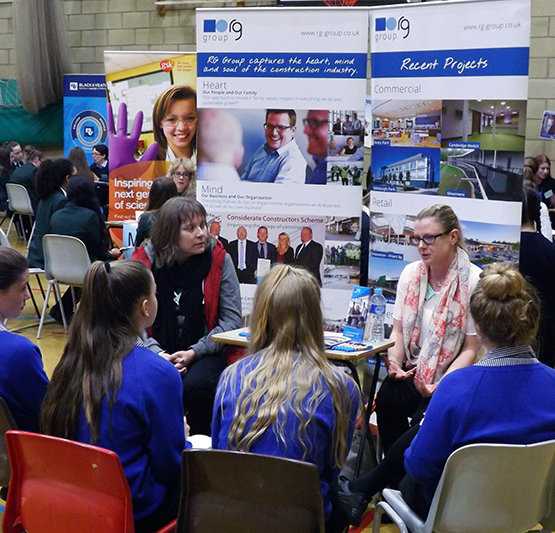 We have participated in local career conventions and as part of this overall program we worked with Warwick Secondary School to support their STEM initiative for attracting young female students to think about joining construction along with explaining the broad spread of skills used in today’s industry. This benefits the students at The Warwick School, as they gain a greater understanding of the construction industry, and shows that RG Group take their responsibility to attract young talent into the industry seriously. We always try to engage with local education establishments while we are working in a particular location/town and we have recently taken on 4 local young trainees.